Now you are ready for the day all thanks to this Eat Popcorn And Watch Movies T-Shirt. The t-shirt is available in style for men, women, and kids and it comes in many colors and sizes too. 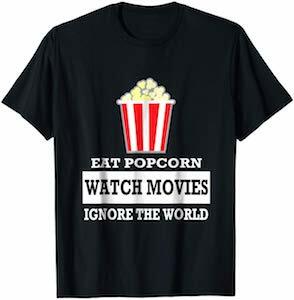 On the t-shirt you can see a big box of popcorn and then below it you can see the text “Eat Popcorn, Watch Movies, Ignore The World” and that is all you need. It’s a great shirt that just describes a couple of days I have once in a while and if you feel like that then time to wear this shirt.